"Nothing Donald says surprises anyone. Donald does not handle losing very well," Cruz said. U.S. Sen. Ted Cruz took the high road Tuesday in his response to rival Donald Trump's use of profanity to describe the Texas Republican. Trump, the GOP frontrunner, derided his opponents while addressing about 5,000 people at a rally Monday, the day before New Hampshire's first-in-the-nation primary election. He contrasted his recent statements on bringing back waterboarding to those of Cruz. "You know he's concerned about the answer because well, some people," Trump said pointing to a woman in the audience, "she just said a terrible thing. You know what she said? Shout it out 'cause I don't wanna." Then he said it anyway: "She said, 'He's a p---y.'" 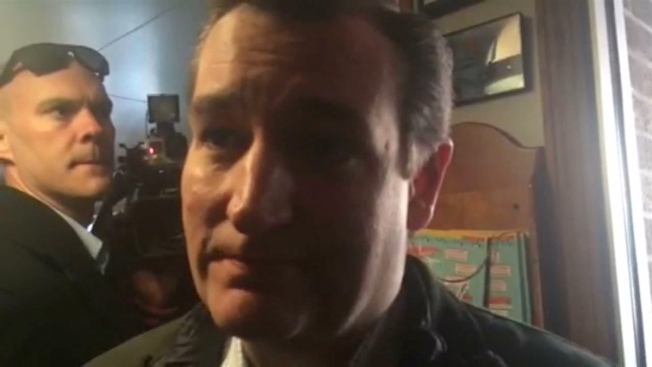 When asked about the comment Tuesday in New Hampshire, Cruz shrugged. "Oh, listen. Nothing Donald says surprises anyone. Donald does not handle losing very well. He didn't like that he lost in Iowa and his response often is to simply yell and insult and engage in profanity," Cruz said. "My approach is not to respond in kind ... I'm going to stay focused on the issues. I'm going to stay focused on the substance." All polls in New Hampshire close by 8 p.m. EST. Up for grabs are 23 Republican delegates, awarded proportionately. Cruz currently leads the delegate count with eight to Trump's seven after the Iowa caucus. Both candidates — and Ohio Gov. John Kasich — earned nine primary votes in New Hampshire's three smallest communities, where residents cast their ballots at midnight.